After leaving school I trained as a product designer at Central St Martins School Of Art in London. man-made environmental crisis around the globe. I wrote a thesis on the changing states of consciousness before and during the industrial revolution. During this time I was inspired by Fritjof Capra’s book ‘The Turning Point’, and Carl Jung’s study of Alchemy. 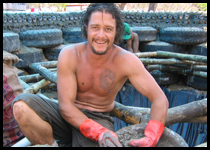 I met Mike Reynolds in May 2003, when he and his crew arrived in the UK on a two-week visit to build a prototype Earthship house in my home town, Brighton. I was inspired by Mike’s apocalyptic view of the future, and by the urgent means by which he and his crew were preparing for it.